Remember when you first moved out of your parent’s house? How old were you? 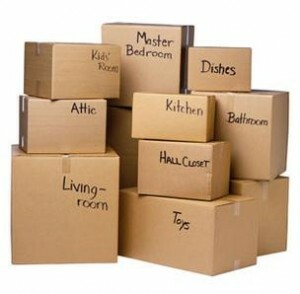 Some people moved out right after graduation to join the military, or head off to college in mere weeks. Others stayed for awhile longer, while I’m sure there are some who have never actually left. For all those who moved out into the world on your own, where did you go, and who did you go with? Were you flying solo or did you have roommates? I am the oldest of three kids, and by age, I was the last to move out of my parent’s house. I had just turned twenty-two when I found my first apartment, and was engaged to Wendy. It was my mom’s idea. She thought that since I was getting married in less than a year, I should have my own place established. She even found me the apartment. Of course, Wendy went with me because she would be moving in, too. My first apartment was only a few blocks from where I lived with my parents. We rented an upper apartment in a big, gray house on the corner of Walnut and Pound Streets. It was a fantastic apartment with two bedrooms, living room, kitchen, and an amazing bathroom. The bathroom was one of the biggest rooms in the apartment. It had a tin ceiling and a cast iron, clawfoot tub. That tub was awesome, especially for two young twenty-somethings. That apartment had radiator heat. The guy who lived downstairs liked it hot, so hot that we kept our own radiators either turned way down or off completely. There were even times that we would open the windows to get some relief from the heat coming up from downstairs. It made for wonderful gas and electric bills while we lived there. We lived there for fourteen or fifteen months before moving to Gasport to live upstairs from Wendy’s grandparents. We moved there so we could save money to buy a house. It was a little bit cheaper than living at the Lockport apartment. They gave us a deal with the monthly costs, which was supposed to help us save for a house. Of course, while we lived there, I bought a 1971 GTO. To say that did not go over well with her grandmother is an understatement. Wendy’s grandfather had chickens and cows. He was a gentleman farmer with just enough animals to make it a hobby rather than a business. It was not unusual to suddenly hear cars honking every time they drove by. When we looked out the window, there would be a cow loose from the pasture, standing in the middle of the road. It was amusing to watch Wendy’s grandmother trying to shoo it back into the fence with an old straw broom. Well, it was amusing until one or both of us were recruited to assist in the bovine retrieval process. One of the most interesting memories about living with Wendy’s grandparents was playing paintball in the field behind the cow pasture. We’d have to turn off the electric fence so we could climb through to get to the other field. We’d play around for several hours, and when we got back to the pasture, all the cows were lined up along the fence trying to figure out what we weer doing. They were curious like cats while we shot each other. Of course, if we forgot to turn the fence back on, we’d inevitably have to grab a broom and herd them back into the enclosure. I guess we lived there about a year and a half, until we bought the house in Lockport where we now live. This Halloween, we will have been living here for twenty years. I really had no plans of moving in next door to my parents. However, on a visit to may parent’s house, I noticed that the Ferris’ house was for sale. While I had grown up next door and delivered the newspaper to that house, I had never been inside. Even when I collected for the paper each week, the money was handed to me through the narrowest of openings for the front door. I wanted to see that house. We set up an appointment with our realtor to see the house. We got our tour three days after it went on the market. Immediately, I loved the woodwork throughout the house and the fireplace. Wendy loved it even more. We put a bid in on the house, which was rejected from the start. I knew how much money I was willing to spend each month, and no realtor was going to make me budge. Oh, but she tried. “It’s only $7 per thousand per month more.” No thank you. We can stay where we’re at for awhile longer. We had the perfect scenario. We were in no rush to leave where we were, and didn’t need to jump at the first house we saw. We had been working with the realtor for several months. She showed us some houses that we liked, but just didn’t really click with is. This house was the first, but we had time. I didn’t need to budge if I didn’t want to. She called us a couple days later saying that a lot of people were interested in the house (there weren’t as many as she claimed. My parents lived next door and could see who was going in and out of the house.) but the owners liked us. They made a counter offer that came down a little, but wasn’t enough of a drop for me. I rejected it. Another day or two went by and they had countered once again with a lower offer, an offer that we accepted. It was $3,000 more than my initial offer, and $9,000 less than their original asking price. I felt that it was a win for me. We moved into our new house the week of Halloween. Being brand new to the house, we did not hand out candy that first year, a fact that my good friend, Tom, reminded me of every year for nearly a decade. This is the house where we’re raising our family. Sure, it has some imperfections, but overall this is our house, forever. One of the biggest selling points for us was the house being in a neighborhood. Wendy grew up in the country, which has its own advantages, but limits the forming of friendships where you can just skip next door. Another selling point also dealt with the children we knew would eventually be a part of our family. We would have a neighborhood school, where we could walk to school. With walking to school, we felt we would have a greater impact on the lives of our children. We would know the other parents. We would know the teachers and feel a part of the community. Unfortunately, with the closing of Washington Hunt, we lost that. It’s just not the same putting your kids on a bus, and then feeling like you’re unwanted when you go to the school. Personally, I think the fact that we’ve forced the parents into an unwanted role at the schools has hurt the whole process. That’s an article for another time. The two things I don’t like about the house? First and foremost is the basement. It’s not really a usable basement. It has stone walls and gets damp when it rains. It’s not refinished like the house in which I grew up. That would be a perfect place for the kids to have a playroom, or for Shenanigans to have a studio. Unfortunately, it just doesn’t work that way. The other thing I wish I had was a double lot. We do a lot of gardening, and we could do more if we just had more green space. The best space to grown food would be in the front yard, but the city has rules about that. Frankly, if we had known that the house across the street was going up for sale less than a year after we bought our house, we would have purchased that one. It is a double lot and deeper than the typical lot. And it backs up to over two acres of undeveloped land that we would have purchased, too. I love our house, though. It’s spacious, even if four kids sometimes makes it feel crowded. I guess I really didn’t ever move too far. I’m 150 feet from where I grew up, and my first apartment was only three blocks away. Even when we lived in Gasport, it was only six miles. Sometimes, when I get my tax bills, I complain about how we should move, but this is definitely my home. We found the house we wanted, and we’ve embraced our lives here. Craig Bacon lives in Lockport. He’s lived in the same neighborhood for 39 years. He’s left his mark on it, but don’t tell the neighbors it was him.